New political party for Indian community in the pipeline | Daily Express Online, Sabah, Malaysia. Kuala Lumpur: A new political party called the Malaysian Advancement Party (MAP) for the Malaysian Indian community will be set up and is awaiting approval by Registrar of Societies (RoS). 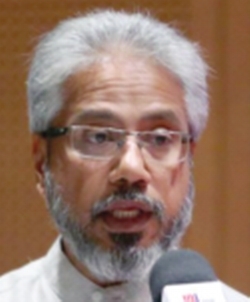 The party's pro-tem chairman Senator P. Waytha Moorthy (pic) said the application to set up the new political party was submitted to the RoS by its pro-tem committee two weeks ago. "The main objectives of the party are to protect, promote and advance the interest of the Malaysian Indian community's political, economic, educational, cultural, religious and social interests. "With the birth of this new political party, there is now a new hope and opportunity for the Malaysian Indian community to ensure that effective representation can be provided so that no one is left behind," he said in a statement Saturday. Waytha Moorthy, who is also Minister in the Prime Minister's Department, said that the Indian community would now have an opportunity to benefit from the growth and development of the nation in a holistic manner. "It will work towards continued empowerment and enhancement of the Indian community coherently with the Federal Constitution, in raising their socio-economic standing and promoting unity and cohesion in the nation," he said. Waytha Moorthy said the party will work and participate with all political parties in Pakatan Harapan (PH) to enhance the reform agenda under 'Malaysia Baru'.